Here’s a snippet from my Regency romance, Lady Elinor’s Escape, in the hero’s point of view for this week’s Book Hooks! a weekly meme hosted by Marketing for Romance Writers. There were too many women in Stephen Chaplin’s life. He had just gotten rid of one, and the last thing he needed was another. He set his mug of coffee on the breakfast table and closed his eyes. Not again. Though he tried to ignore the agitated female who had just burst through the doorway to the Horse and Cart Inn as if the hounds of hell were after her, he could not help overhearing her conversation. She was in trouble. He’d wager his last shilling on it. Lady Elinor Ashworth always longed for adventure, but when she runs away from her abusive aunt, she finds more than she bargained for. Elinor fears her aunt who is irrational and dangerous, threatening Elinor and anyone she associates with. When she encounters an inquisitive gentleman, she accepts his help, but fearing for his safety, hides her identity by pretending to be a seamstress. She resists his every attempt to draw her out, all the while fighting her attraction to him. There are too many women in barrister Stephen Chaplin’s life, but he has never been able to turn his back on a damsel in distress. The younger son of a baronet is a ‘rescuer’ of troubled females, an unusual vocation fueled guilt over his failure to save the woman he loved from her brutal husband. He cannot help falling in love with his secretive seamstress, but to his dismay, the truth of her background reveals Stephen as the ineligible party. Buy now from Amazon, All Romance eBooks, BN/Nook, iTunes, Kobo and Smashwords. Leave a comment below, and don’t forget to enter this month’s Rafflecopter for a chance to win a $10 Amazon gift card & 2015 Mouse Pad Calendar. Use the linky list below to hop to more MFRW BookHooks! 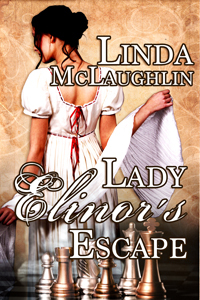 This entry was posted in blog hop, Uncategorized and tagged blog hop, Book Hooks!, excerpt, historical romance, lady elinor's escape, Regency romance by Linda / Lyndi. Bookmark the permalink. Great writing – as usual. I love Regency Romances, though I only read them. Regency romance has unique qualities, and it’s imperative that an author can capture the Regency voice. I discovered my Regency voice by accident, and I was so glad because I love the subgenre. This is my first Book Hooks…I’m enjoying visiting other author sites. I should do this more often! Thanks for stopping by, Ruth. I’m going to try to get to everyone’s site this afternoon. Welcome to Book Hooks! Oh, these women who pretend to be someone they are not, and lovely rescuing men. I love them all! LOL, he has no idea! Oh never say the last thing you need is – cause that’s exactly what lands in your lap. Guess he’s going to lose his shilling. Great snippet.